I’m also releasing the Book of Mormon study edition in 14 new languages: Afrikaans, Cebuano, Danish, Dutch, Hmong, Hungarian, Norwegian, Romanian, Russian, Swahili, Swedish, Tagalog, Turkish, and Vietnamese. A week or two ago I was reading the Book of Mormon with my wife and noticed the part at the beginning where it talks about which books were part of the small plates of Nephi and which were part of the large plates. I don’t normally think of the Book of Mormon broken up that way — usually, I just think of it as a flat list of books — but the idea intrigued me. 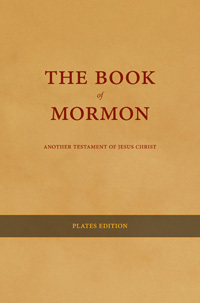 The result: The Book of Mormon: Plates Edition, an experimental edition now available in ePub. What’s different? Just the divisions between books and chapters. Beyond the main small/large plates grouping, I’ve made new books to indicate where the record changes (for example, the Book of Omni actually has several different authors, and I’ve broken it up so they each have their own record; I’ve also pulled the record of Zeniff out of Mosiah into its own book) and made the authors’ lineages more clear in the table of contents. The words themselves haven’t changed, nor has the order of the text. So yes, it’s different and even a little weird. Keep in mind that this isn’t by any means meant to supplant the standard edition — it’s just another way of looking at the Book of Mormon. Enjoy. Unless otherwise noted, content is under a Creative Commons license (Attribution-ShareAlike).